On Monday, I posted that representatives from the New York State Department of Environmental Conservation were presenting environmental groups with aspects of Gov. Andrew Cuomo’s plan to begin shale gas development in New York. I have since learned more about the plan from sources who have been briefed on it. These details were presented as conditions “on the table” to allow permitting of initial wells, with the final outcome still a work in progress. It’s worth keeping in mind that the Cuomo administration briefed environmental groups on these points in the wake of criticism that the DEC was working too closely with industry to develop the plans. It’s also worth noting that these ideas have been presented to environmental groups verbally but not in writing, according to my sources. Here's a summary of some major points. Timing and location: Permitting could begin later this year – pending some legislative unknowns that I will discuss in a minute. As previously reported, a ramp-up phase of 50 wells or less for the first year would begin in Broome County and adjoining counties along the Pennsylvania border, which overlie some of the richest parts of the Marcellus Shale. The first wells would likely be cited in areas closest to the Millennium Pipeline. Green Completion: Before new wells are hooked up to the grid, gas is commonly vented or burned off in a process known as flaring to release excessive pressure in the well bore that can cause methane migration and other problems. The DEC plan would require that gathering pipelines and processing systems be in place before initial wells are completed. This would reduce emissions by minimizing the need to vent excessive pressure building in wells waiting to be tied in to the system. Monitoring wells: During the initial ramp up, three monitoring wells would be required around each gas well. These wells would provide comprehensive analytical data to track changes in the ground water. Essentially, this requirement would go a step further than the groundwater baseline testing offered in the current plan. Inspection: DEC staff would have to complete 13 on-site inspections during the permitting and drilling of each well. Waste classification: Although the industry uses classified hazardous materials in fracking solutions injected into the ground to stimulate gas flow, the waste that flows back out is exempt from federal hazardous waste laws. Therefore, it is not subject to the handling, tracking, and disposal requirements that govern hazardous waste. State laws are subject to a national exemption for the industry, so there is no way around this, according to the DEC interpretation. The DEC is requiring a closed loop system for some aspects of the operation, which means fluids will be stored in tanks and some of it “recycled” based on the industry needs and discretion; but there is no technical definition for “recycling” or ways to effectively measure this. Accounting for how much waste will be produced, and where it will end up, remains a major issue for environmental groups, and likely grounds for a legal challenge to the state’s plan once it is finalized. Public Comment: Permitting for each well would require a 15-day public comment period, but no public hearings. Well plugging: There was some inconclusive discussion about requiring or providing incentives for operators to find and plug an orphan well before developing a new shale gas well. New York state has more than 1,400 abandoned, unplugged gas wells, and perhaps tens of thousands more undocumented. Wells are often abandoned when things go wrong, operators run out of money, or they are unproductive. The legacy of abandoned wells presents risks related to methane migration, and hazards for drillers who unexpectedly drill through them while developing a new well. Sometimes orphan wells cause near misses, as when Shell Appalachia accidently drilled through one in July, causing a methane geyser that was eventually brought under control. Other times they cause fatalities, as when an explosion in July 2008 killed a resident who tried to light a candle in the bathroom in Marion Township, Pa., The Pennsylvania DEP’s record of the event linked the explosion to gas migrating into the septic system from an old gas well with deteriorated casing. Vertical versus horizontal wells: The new policy (outlined in a document called the Supplemental Generic Environmental Impact Statement or SGEIS) is being developed only for shale gas wells that use high volume hydraulic fracturing and horizontal drilling. It does not apply to conventional wells drilled vertically using 300,000 gallons or less of fracking fluid. Some environmental groups have pointed out that shale gas operators often use vertical wells (which can later be turned into horizontal wells) to begin exploring shale formations and to lock up lease holdings indefinitely. The shale gas era in New York could begin with conventional development by operators and speculators who want to prove up the play and set the stage for future development, even in zones (like the New York City water supply in the Delaware River watershed) where high volume hydraulic fracturing is off limits in the current political climate. This scenario is more likely if the price of gas rises to support this kind of exploration. Funding: The DEC Commissioner Joseph Martens has said the agency will issue permits only at a rate that it can keep up with. So a small staff means a small number of permits. Still it remains to be seen how the agency will handle its new tasks of on–site inspections, permit processing, review of public comments, and reviewing and monitoring analytical results, even in the absence of problems. There will be more pressure on the agency facing an uptick in development as the price of gas rises. Home Rule: The rights of local governments to ban shale gas development has been recently recognized by the New York State Supreme Court, which upheld local drilling bans in the towns of Dryden and Middlefield. New York State Environmental Conservation Law, however, states that local governments do not have jurisdiction over gas well development. It will likely take legislation to resolve this key inconsistency in the ongoing Home Rule. The state Assembly, controlled by Democrats, has passed a bill amending the conservation law to reflect local governments’ right to control drilling. The bill was not taken up by the Republican controlled Senate. Health impact study: Technically, the Cuomo administration does not need to evaluate the impact of drilling on public health to go forward, but this is a big point for environmental groups. Democratic lawmakers have held up lack of a health impact study as a centerpiece to their opposition to shale gas development. Another high-profile legislative sticking point is funding. The state DEC staffing has been cut, and there are no plans to add staff members to take on the tasks of permitting, inspecting, and overseeing shale gas development. I have heard from lawmakers and aides that a fight to fund increased enforcement would be “epic.” I will add one more word. Critical. The best regulations in the world mean little if there are no resources to ensure their enforcement. The policy overhaul is now entering its fifth year, and the Cuomo administration is sending mixed signals regarding when it will be complete. DEC Commissioner Joseph Martens is using media opts to remind the public of the amount of work that needs to be done. Gannett’s Jon Campbell reported today that the state’s latest draft of the SGEIS has grown from 1,500 pages to 4,000 pages as officials try to reflect input from tens of thousands of stakeholders submitted during public hearings and comment periods. Cuomo has said on more than one occasion this year that a finalized SGEIS is imminent, and many have taken that to mean by the end of summer. It is likely the Cuomo administration will not wait for all of these legislative issues to be squared away before he finalizes his permitting policy. If permitting begins, even on a limited basis, before issues of Home Rule and funding are resolved, it will signal the beginning of the shale gas development in New York and a plan-as-we-go approach. If they are held up for legislation, either by legal challenges from environmental groups (which are likely) or by Cuomo’s design, it may signal another indefinite delay. If Cuomo wants to open the door for a future presidential bid, he will want to avoid the label as the guy who kept the shale gas industry from New York. Passing issues onto the legislature and local municipalities to resolve is a strategy that may help him in the long run. And many of these flaws cannot be solved with more paper. NO public health assessment. NO wastewater disposal facilities anywhere in NY. NO cumulative impacts studied. If these things were studied, THERE WOULD BE A BAN. The people are demanding a BAN. We don't need a demonstration project here. We've got on in PA. I just heard Craig Stevens speak last night. He quotes Einstein: "Insanity is repeating the same action and expecting different results." Cuomo will not issue one permit. Unless he wants a civil war. The Elders have been meeting. We will defend this land and our water and future generations. Ashe', Aho, and so Mote it Be. There is no fixing this later, we are the turning point. What about his bid for president when things go wrong? Yes, I agree with Yvonne, Tom. "If Cuomo wants to open the door for a future presidential bid, he will want to avoid the label as the guy who kept the shale gas industry from New York." He will? Among what audience? Among the big-money bankers, oil-co. investors, maybe. But a BAN ON FRACKING would make him a POPULIST darling. But maybe that's moot, since with the present rigged electoral system, including the complacency and worse of the corporate press, the chances of a populist getting elected are about zero. All antifrackers..I am looking for 1500 of you to get me on the ballot with one page of ten signatures...they are due in Albany August 23 rd..I need them by me by August 18-19 or so at the latest. I've appealed to David Braun and others who have giant e-lists. Go to my web site and download the petitions. They have to be done correctly. If 1500 did one page or 750 did two pages, I would qualify. I am for writing federal legislation to ban fracking federally. My conversation a week ago with an environmental group board member was dismaying; they want fracking for the 'economically depressed Souther Tier' and for more gas supply to the US. That's what he said and he is a BOARD member, not general member. I also have major student loan reform proposals in writing already and much more. I am progressive. Senator Gillibrand, who took $5000 in PAC money from Chesapeake is not progressive for that and many more reasons, including wanting 'safe fracking'. Your call. This is a big decision of yours..I've already invested over $60,000 in my campaign which is nothing to her money. To which environmental group were you speaking? It sounds like the NRDC but it would be helpful to know. I've signed your petition already. Good luck! Thanks, Tom, for your excellent overview and - as always - seeking the truth. And please, spread the word by forwarding this message to everyone you know in NYS. Help us change the conversation about gas drilling. Let us show the world how much New York's landowners love their land. Thank You! Which environmental groups have been briefed? The large, national environmental groups do not have a great track record on fracking (to cite just one example, the Sierra Club's initial pro-shale-gas position may have been influenced by very large donations from the gas industry). But there are numerous small, well-informed grassroots groups in NY whose members have been drawn from the regions where fracking is likely to occur. As far as I know, these groups have had little or no formal attention from Albany or the NYSDEC. Groups briefed by the DEC include the Sierra Club, the NRDC, Environmental Working Group, Earth Justice, and EDF, but there may be more. To address Angela Fox's note below, my intention is certainly not to create a sense of fear and betrayal, but to do my best to fairly inform readers and stakeholders so they can move the discussion forward. Thank you for your reply, Tom. After decades of donations, I have stopped donating to EDF and the Sierra Club because of their pro-shale-gas positions. After I stopped donating to the Sierra Club, the news broke about the Club having accepted millions of dollars in donations from the gas industry. The Sierra Club's position on shale gas has improved under the leadership of Michael Brune, but it has not improved enough to persuade me to resume donations. At this point I am so cynical about these groups that I doubt I will ever donate to them again. Instead I donate to small, grassroots organizations. If the leaders of groups like EDF and the Sierra Club and the NRDC had to live next door to gas wells and compressor stations, then I doubt that they would be taking a "drill, but regulate" approach. They would be asking for a ban on fracking, at least in populated areas. The leaders of national environmental groups make very respectable salaries (I've checked--in most cases it's public information). It is highly unlikely that any of them will ever find themselves (and their families) trapped in a house that is in the middle of a gas field--they all make enough money to avoid or escape such a situation. The average person is not so lucky. This is one of the many reasons why Governor Cuomo should be paying a lot more attention to the grassroots groups that are drawn from his own constituency. CORRECTION to my reply above in response to Mary's questions about names of the groups that received DEC briefings: Environmental Working Group was not one of them. Having received several of emails stating that the DEC has been meeting with "several environmental groups" I would like to know why you are reporting discussions with these various groups without identifying who they are. Are your postings aimed at creating a sense of fear, anxiety and betrayal among the various environmental groups. I am calling upon you personally to do some honest reporting. WHO ARE THE ENVIRONMENTAL GROUPS YOU ARE WRITING ABOUT??. Should Cuomo allow Fracking in NYS (where agriculture (which requires pure water) is the biggest business in the state, he can kiss any Presidential aspirations goodbye. Those of us who will have to live with his decisions will be extraordianrily vocal on a national scale. You think you have seen grassroots efforts to date? As the saying goes, "you ain't seen nothin yet". 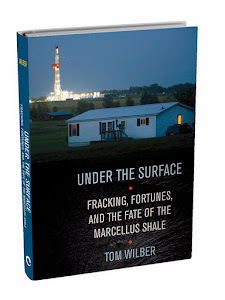 Mr. Wilber, you say: "If Cuomo wants to open the door for a future presidential bid, he will want to avoid the label as the guy who kept the shale gas industry from New York." I say: "If Cuomo wants to open the door for a future presidential bid, he will want to avoid allowing or permitting the shale gas industry from Fracking New York in any way, shape, or form. That includes pipelines, waste in all its forms, compressor stations,and transport." The whole world is watching and hoping Cuomo stops fracking, if he allows fracking his chances at the presidency, or even for a second term will be nill. Thanks Aunt Mary, and to others, for your thoughts regarding fracking and Cuomo’s long term political legacy. Right or wrong, I base my observation about Cuomo’s national political aspirations partly on history and partly on current events. Has a presidential candidate ever gotten to the white house on a platform opposed to Big Oil? You will note that there is little discussion of fracking in this election (which I think is too bad) because the two major party candidates both support it. The political culture in New York does not fit neatly with the campaigning template for the rest of the country. That said, there is a lot still to play out, and things can change in four years. As of now, though, there are no signs of an anti-fracking political stance from Cuomo’s camp. Tom, thank you for this report. However, recheck your statement in regard to Home Rule that the local governments do not have juridiction over gas well "development". I believe the ECL says that local governments cannot "regulate" the gas & oil industries. The SGEIS does allow local governments to pass zoning or land use plans which exclude those industries from operating within designated juridictions. The DEC will not issue permits that conflict with those "land use" areas. Pernah bagikeun( tiết lộ bí mật về công dụng của van điện từ ) Rahasia anjeun( lí do vì sao van điện từ bị nóng ) kalayan saha sabab bisa uing anjeun( cấu tạo của van điện từ bạn biết chưa ). Ieu meureun nasehat( van điện từ ) pangpentingna kantos.